The ChrisMare Taormina Hotel is situated 51 km from Catania, a 15-minute drive from Taormina, 30 minutes from Mount Etna, 30 minutes from the Alcantara Gorges. Located directly in front of Mazzeo beach, it is just 300 meters from Letojanni and 51 km from Catania’s Fontanarossa airport…..
To stay in ChrisMare Taormina Hotel rooms is to experience an atmosphere full of suggestions. To be pleasantly surprised, where every detail is specifically designed to enhance the well-being of guests. Rooms which are an oasis of comfort and warmth, a fine habitat at an affordable price…..
During your stay you can make use of our car and bike rental service and explore the area surrounding the hotel, renowned for snorkeling and diving in the clear sea. 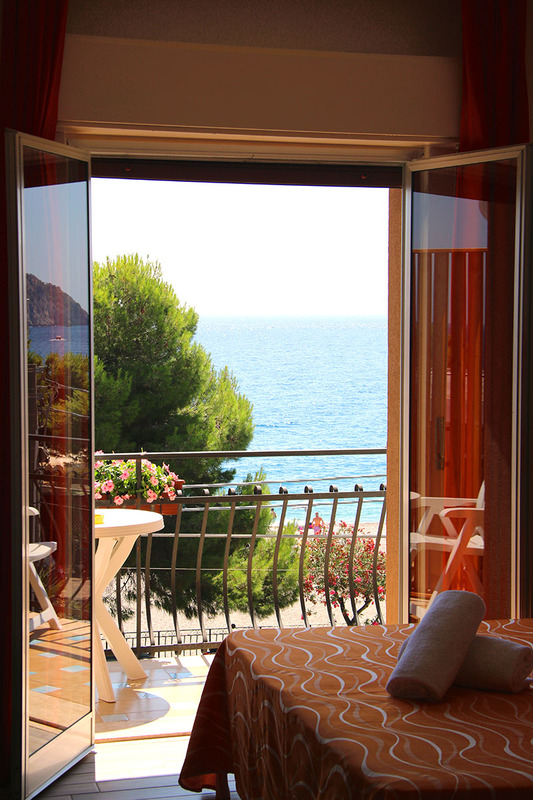 Rooms with a balcony overlooking the sea. Breakfast, dinner or lunch served in the garden (with typical local dishes). Secure parking indoors. We are open all year round…..
ChrisMare Taormina Hotel at Mazzeo is a 4-star hotel and is located directly by the sea near the center of Taormina. The Hotel welcomes all its guests in a cozy atmosphere, with its polite and friendly staff who are always willing to help, where nothing is too much trouble. A unique place to spend your holiday relaxing in front of a beautiful beach, famous for the clear water of its sea and its typical fine sand. The rooms are a chance to experience an atmosphere full of suggestions at the ChrisMare Taormina Hotel. To be pleasantly surprised, where every detail is specifically designed to enhance the well-being of guests. Rooms which are an oasis of comfort and warmth, a fine habitat at an affordable price. Each room is uniquely distinctive in its functionality, comfort, technology and facilities. Mazzeo beach is a long and wide sandy coastline that stretches from Taormina to Letojanni, its sea famous for its clear water, which offers maximum relaxation to enjoy our beach to the full. ChrisMare Taormina Hotel is located directly on the seafront of Mazzeo and enjoys a warm and friendly atmosphere. ChrisMare Taormina Hotel has a garden where you can have breakfast, dinner or lunch. Typical à la carte Sicilian cuisine of fish or meat is the daily fare. We are open all year. The restaurant is open all the year round, also for dining outdoors. ChrisMare Taormina Hotel offers its guests secure indoor parking. Possibility of free parking also outdoors. the historic center of Taormina, Castelmola, the Naxos Gardens, Forza D’Agro, Savoca, The Alcantara Valley (with its gorges), Mount Etna, The Cyclops Riviera, Acireale, Acicastello and Acitrezza, not to mention: The cities of Catania and Messina. In addition, after a short walk from the hotel you will find coach excursions leaving for the day for Agrigento, Siracusa, Noto, Palermo and the Aeolian Islands, Lipari, Vulcano, Panarea and Stromboli, and returning in the evening.